April 2018 marks the 107th month of the current economic expansion that had begun in June of 2009. This expansion surpassed what was previously regarded as the second longest economic expansion in US history from February 1961 to December 1969. 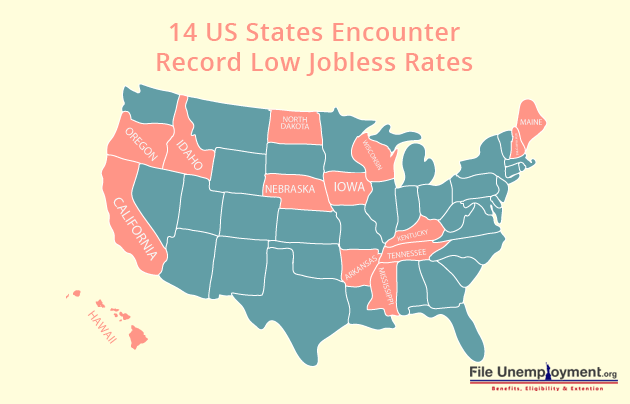 With the assumption that this economic performance continues, the record low jobless rates in 14 states will become part of the second longest economic expansion in US history. The State of California as well set a new record last month. 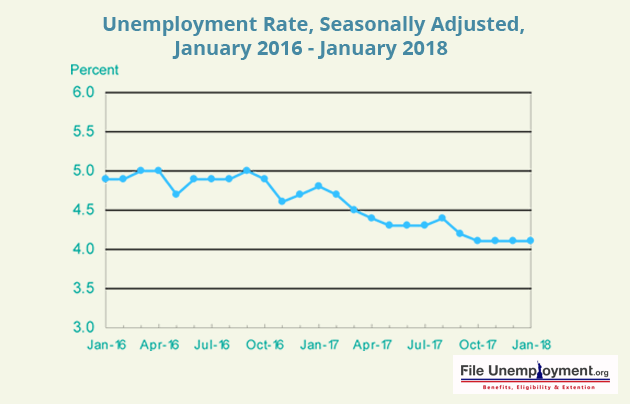 The unemployment rate of the Golden State stands at 4.1% according to the unemployment situation a bi-monthly report published by the United States Bureau of Labor Statistics. That’s the lowest rate recorded since BLS began keeping track of state-level unemployment figures in 1976. It’s a third of the 12.3% unemployment rate California notched at the height of the recession in December 2010. Among the other states to reach an all-time low is Colorado at 2.6%, Alabama at 3.7%, Texas at 3.9%. All these states have attained an all-time low in comparison to the 8.3% they averaged during the recession period of December 2010. In terms of the remainder of the 14 states with the low unemployment rate, Tennessee has fallen to the lowest unemployment rate it has ever measured, 3.3 percent, in January. Hawaii’s unemployment rate is the lowest in the nation. Idaho, Iowa, Maine, Nebraska, New Hampshire, North Dakota and Wisconsin all have unemployment rates lower than 3%. It seems likely that the current economic and job growth continues well into next year. It also depends on a major trade war or other major economic/political risks that would derail the expansion. May of 2019 will be the 121st month of the current expansion and will break the previous record 120-month expansion from March 1991 to March 2001. In the meantime, the two important economic milestones outlined above of record jobless rates in more than one out of four US states. Along with surpassing the previous 106-month record for the second longest uninterrupted period of economic expansion in US history. The decline in unemployment rates is a reason for the public of the United States should rejoice! An unemployed youth is one who does not have a job, but actively seeks for one based on their educational qualifications. The United Nations categorizes a person as unemployed on the basis of one who is qualified, willing and able to work, but does not find any job based on their specialization. According to the United States Bureau of Labor Statistics, the unemployment rates among persons between 16-24 years stood at 9.9% in February 2017 and 8.8% in May, 2017. However, there was a gradual drop in youth unemployment that stood at 9% in February, 2018. Frictional unemployment happens when workers leave their jobs to find new ones. In most cases, it is a voluntary decision which can result in layoff or termination of the employee. Here, the word friction is referred to the time, effort and expense that a worker takes to find a new job. It is unavoidable because it is integral to a job search process. Some unemployed persons have saved enough money and quit their job due to having enough financial resources to keep them afloat. When job-seekers re-enter the workforce. These are people who went through a period in their lives when they decided to stop looking for jobs. There could be multiple reasons for a person to quit a job. Some cases include raising children, getting married and taking care of the elderly. Frictional unemployment can be reduced by bringing better information about jobs to the workers. In a booming economy, usually jobs are in a higher supply. Often employers have a hard time finding qualified candidates. In the expansion phase of the business cycle, workers feel more confident to quit their job in search of a better one. 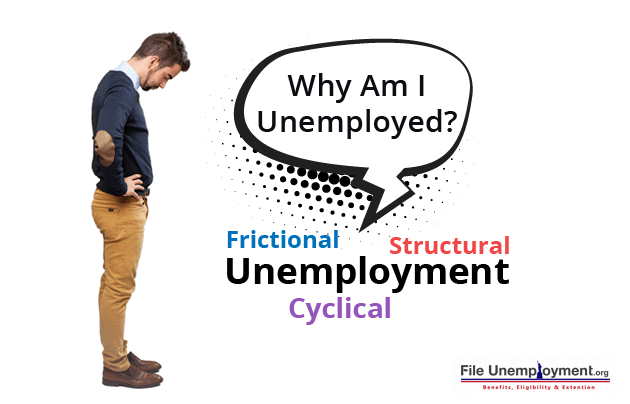 Structural unemployment is a form of unemployment that is generally caused by a mismatch between the skills that workers in the economy can offer and the skills demanded by employers. It usually occurs due to technological changes that make the job skills of workers outdated. Structural unemployment happens due to non-tailored education to fit individuals to the labor market. As a result young people find it hard to find jobs according to their specialization. Cyclical unemployment occurs only when workers lose their jobs because of down turns on the business cycle. It is generally considered to be the major cause of high unemployment. Unemployment gradually recovers from the recession and soon the unemployed have more chances of getting hired. Cyclical unemployment is temporary depending on the degree of recession or depression in a country. Review your unemployment eligibility with our Eligibility Calculator. Cyclical unemployment results from a large drop in demand. It usually starts when a consumer demand for goods and services drop, business revenues decline, etc. Once companies are affected by such problems, workers are given layoffs. Cyclical unemployment occurs when there is not enough demand for goods and services in the economy at large to provide jobs. How To Curb Youth Unemployment In America? Ensure that university students are exposed to industry needs and the current labor market. This will help them find careers that suit their interests while making the best use of their skills. Students who have this exposure will be able to explore several career options during college through internships, apprenticeship, job shadowing, and classroom-based community projects. With the evolving nature of industries, the market labor requirements also changes. Universities must keep up to this changing trend by altering the academic curriculum and look at how it will cater to various industrial requirements. Thus, the academic curriculum must be revised and focused towards the practicality of industrial standards. The immense reliance over classroom methodology and theory extincts students from a practical formula of knowing how to progress in an industry. Some universities and colleges in the US have started to provide students with real-world applications and work environments. One such example is Oregon University’s Sustainable Cities initiative. Here, university students have to partner with business leaders and local government officials to create a business plan and solution to real problems in the line of sustainable cities, transportation, infrastructure and city planning. This initiative exposes students to a practical level of industrial requirements and makes them ready for the job without undergoing any industrial training. Programs that are aimed to focus on industry standards, based on innovative practices to connect students to employers, before they get a job will drive them to a practical forefront. A university or college that responds quickly to industry needs will not just attract individuals seeking for an employment, but will also attract companies looking for professional development opportunities for their employees. For example, companies like Modern Technology Council and General Assembly collaborate and work with students after they have completed their formal education. This is an exercise to help them improve their skills needed to be ready to enter into the industry of their choice. Companies tie up with colleges and universities to provide recruiting requirements and in due course of time, the university trains students on basis of industry curriculum. This type of an academic progress will help update and revise educational syllabus to suit it to industrial standards. The United States government began tracking unemployment officially in the 1950s, but estimates before the 1950s was assessed. The Great Depression of the the early 1930s had an employment rate of 23.6% which is considered the highest till date. The country’s lowest rate was 1.2% in 1944 during World War II, where the economy was over driven. The lowest rate of unemployment seen in the United States post World War II was 2.9% in 1953. In total, the United States has witnessed 11 recessions since 1948 (Postwar period). During the 1980s, the unemployment rate reached a peak of 10.8% and then fell to 5.3% at the end of President Ronald Reagan’s second term. In 1992, it again rose to 7.5% under George H.W. Bush. The Great Recession pushed it above 10% and stayed above 8% until September, 2012. Some economists state that, the proposal of the American Jobs Act by President Barack Obama, if enacted, would have brought the rate of unemployment below 7%. Since the job market has been steady, look at boom-towns and other options to help define you grow your career. If you are still unemployed and willing to work then you should use the Benefits Calculator. Read about the the base period and the qualifying wages and the duration of receiving benefits and the amount of weekly benefits based on your state. We’re all ears to listen to your queries on American unemployment and you can share your suggestions in the comment section. 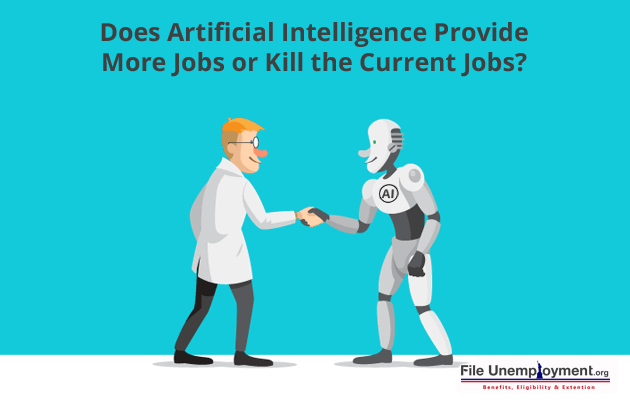 Artificial Intelligence is set to change the landscape of the job market by cutting jobs, adding Artificial Intelligence (AI) related jobs and ensuring that the workforce continues to reskill themselves. 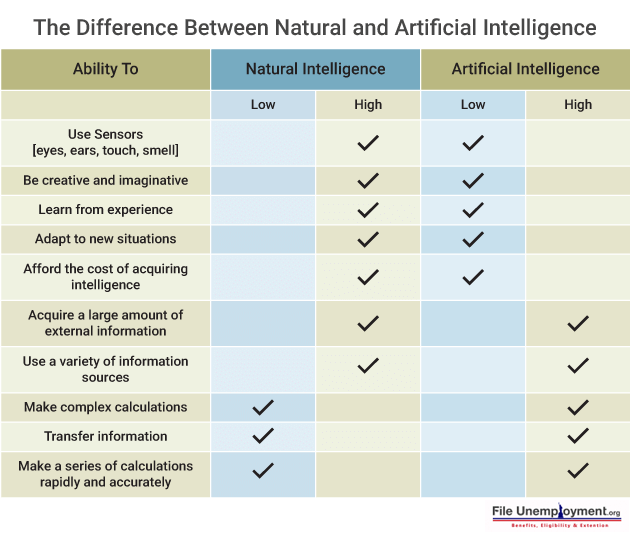 After all, AI was developed based on the theory and the development of computers that are able to perform tasks that require human intelligence. This could be visual perception, decision making, speech recognition, and translation. This term was coined in 1956 and has now become popular based on advanced algorithms, data volumes, and significant improvement in storage and computing power. During the 1950s, AI revolved around symbolic methods and problem-solving. In the 1960s, the US Department of Defense started training computers to mimic basic human reasoning. It was the Defense Advanced Research Projects Agency that did street mapping projects in the 1970s. In fact, DARPA had intelligent personal assistants in 2003 way before Cortana, Alexa, and Siri. This resulted in automation and formal reasoning that computers possess today. This includes smart search systems and decision support systems that will complement and augment human abilities. AI technologies have now been able to help specific benefits in all industries like healthcare, retail, and sports. 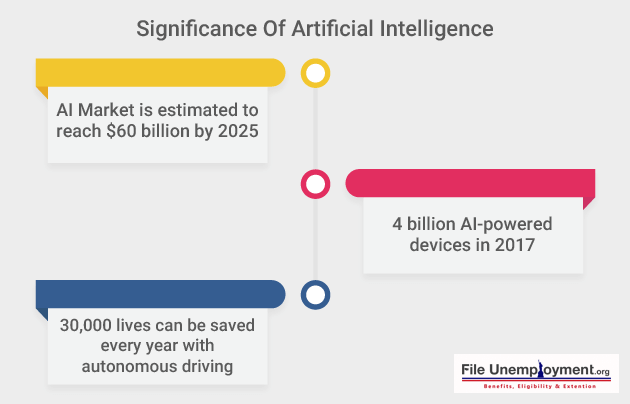 AI is the new technological frontier, countries, and companies are working hard to gain control of this emerging technology. Alphabet has invested $30 billion and Baidu set aside $20 billion to develop AI technologies. Goldman Sachs suggests that self-driving vehicles will make 25,000 truckers lose their jobs every month. Similarly, large warehouses can now operate with just a dozen people and this is set to affect nearly 1 million packers and pickers in the US. Companies like Amazon Robotics are using a combination of advanced robotics and a combination of artificial intelligence to help big-box retailers with logistics solutions. DARPA, the organization behind the internet and GPS navigation is currently working with Boston Dynamics to create robots for disaster relief and also worked on the Atlas robot. Earlier, publishers would spend hours and even days to create content for their website and social media. Wibbitz allows publishers to create videos in minutes and the Associated Press uses a tool called Wordsmith to create news stories based on earnings data. In 2018, you can expect more media professionals and companies to use natural-language and video-generated technologies. In 2017 alone, there were over 20 million Amazon smart speakers sold and this is without counting the number of Google Home and Apple Airpod devices. By this, you can imagine the number of Americans that can control their homes by interacting with technology by using voice commands. By the end of 2018, consumers should be able to interact with smart assistants that will be integrated with smartphones, televisions, and computers. This is great news for data scientists that will see a growth of over 2.7 million jobs by 2020. These AI jobs would be required to enhance AI machine-learning requires probability to determine the proper decision and answer for a given problem. The platforms require more data to make better predictions. With the growth of the company, it will make it more cumbersome to analyze data and hence there is a need to hire data scientists to handle large data sets to aid these AI platforms. Today robotic automation has grown to be a disruptive force. Even now two-thirds of Americans feel that robots would perform most work done by humans in the next 50 years. In addition, nearly 80% feel that their current jobs will most probably exist in their current form within the same timeframe. The recently concluded World Economic Forum suggests that automation including AI would result in the loss of close to 5 million jobs globally by 2020. Similarly, the International Labor Organization states that nearly 137 million workers in countries like Philippines, Thailand, Cambodia, and Vietnam which accounts for 56% of the total workforce of the countries would be displaced by robots. These workers are mainly from the garment manufacturing industry. But on the contrary, Genpact CEO NV Tyagarajan feels that there would be a sizable number of jobs that this technology would create. From data suggested by the Robotics Industries Association, it reveals that robots are likely to become the workforce of tomorrow. Within the first half of 2016, North American robotics technology vendors sold 14,583 worth over $817 million to companies across the world. More than 265,000 robots would be deployed at factories across the country and placing the US in third place when it comes to robotics deployments after China and Japan. Robotic automation requires servicing and programming with the help of high-skill jobs for technicians, programmers, and others. This will create a new set of high-skilled jobs but for every job created by robotic automation, several thousand jobs would be eliminated and this would be disruptive to any workforce. You should know that by the end of 2018, one-third of robotic deployments would be smarter, more efficient and would be able to collaborate with other robots. This would allow them to work safely alongside humans. In early 2019, there would be a Chief Robotics Officer for 30% or more of the world’s leading companies. Several governments around the world will have drafted or implemented specific legislation surrounding robots and safety, security and privacy. When the year 2020 approaches, average salaries in the robotics sector will increase by 60% and nearly a third of the available jobs in robotics will remain vacant due to a shortage of skilled workers in this sector. The field of robotics favors Trump as he pledged to bring back manufacturing to the US. But on the downside, it would not help in bringing back jobs for lower-skilled workers. Corporations can mitigate against increasing labor costs in the US without compromising on profit margins to automate low-skilled jobs. This means that this can bring back manufacturing back to the US or create new jobs but not both together. Since millions of jobs would be at risk and the worldwide employment crisis looms at large, the only logical thing to do is to enhance the education of tomorrow. This means that people would have to learn about AI and the robotic workforce. In some markets that have unstable employment, developed nations look to science, technology, engineering, and math or STEM graduates to stay competitive. 2017 is the year of the hype cycle for emerging technologies as AI will automate 1.8 million people out of work by 2020. While job losses generate the most interest among the headlines, losses only tell a part of the story. 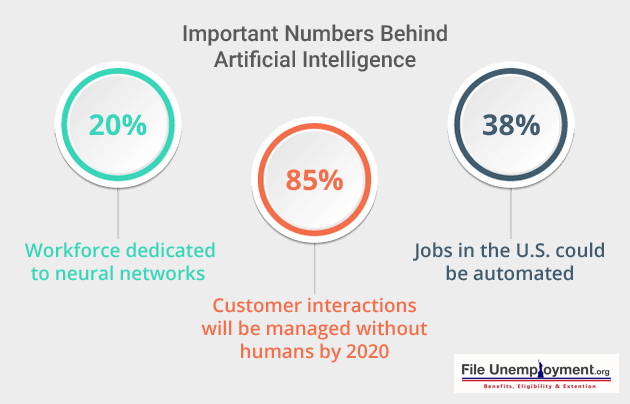 But once you review the possibilities of AI, you will come to know that it will create 2.3 million jobs by 2020 with a net gain of 500,000 jobs. In time, you would question how many companies would successfully deploy AI and not replace the human workforce. This means that in time, it would help humans be faster and more productive. The notion of technology being a killer of jobs has plagued the job market for several years. Automation has made it cheaper to produce fabric and led to more customers. This, in turn, drove demand and the product. Since the job changed, during the industrial revolution, there has been no shortage of work for semi-skilled labor. While 21 percent viewed AI as something to excited about, 17 percent felt it would be disrupting and enabling, while 9 percent felt AI would displace most jobs in 10 years. There are a number of positions that are developing around AI. This includes data scientists, AI trainers, capabilities related to modeling, computational intelligence, mathematics, machine learning, linguistics, neuroscience, and psychology. AI will take on more work that we currently handle, constantly learn and adapt to new skills which will be the same for every worker to maintain their job. The challenge now is how is AI related to the change in the scope of human jobs in the light of AI’s automation and autonomy. Though the potential effect of AI on jobs includes job losses, it would also require a number of AI-related skills. You should also know that AI cannot completely replace human judgment. AI is today, just a manifestation of an ongoing workplace evolution. Since the industrial revolution, there are many innovations that are associated with the transition period of temporary job loss. This is then followed by recovery and the business transformation. In a similar manner, AI would likely follow suit. 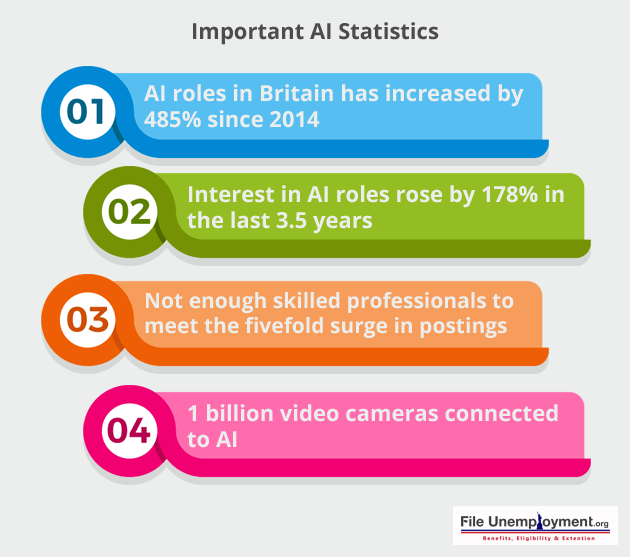 Moving forward workers and leaders looking at AI as a robot would steal jobs and hence should start looking at intelligence augmentation (IA). To mitigate this issue of having a lack of well-trained professionals, businesses should look inward and enforce reskilling and on-the-job training. In time, staff trained in AI would be able to focus on critical activities which in turn would boost productivity. 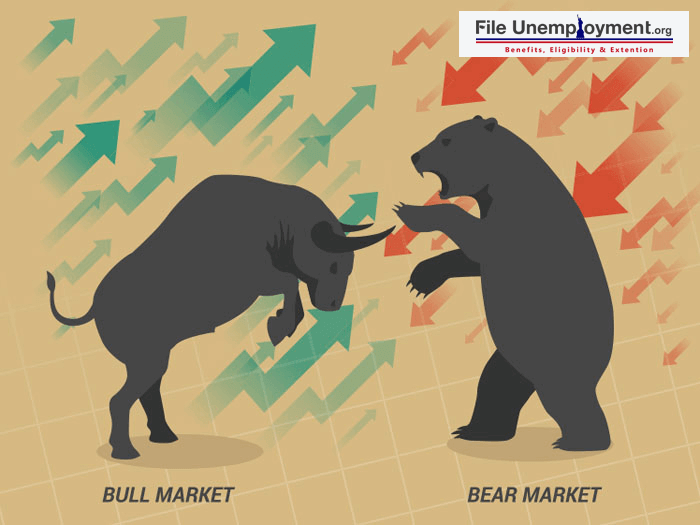 The Employment situation is a monthly report provided by the US Bureau of Labour statistics. The report mainly consists of data which involves the unemployment rates in the country. This unemployment rate research takes into account all factors such as unemployment in the terms of ethnicity, race, gender, age and industry. The report also examines the improvement/decline in wage among companies. While the report does provide the data, here are the important highlights simplified to make it easier to understand for the common reader. The employment situation in the United States remains unchanged for the fourth consecutive month at 4.1 %. In terms of the number of people, that too remains relatively unchanged with 6.7 million people unemployed. When it comes to the major working groups, the black community had a rise in unemployment to about 7.7% while unemployment among the whites decreased to 3.5%. The jobless rates remained similar to that of last month with adult men (3.9%), adult women (3.6%), teenagers (13.9%), Asians (3.0%) and Hispanics (5.0%). In terms of long-term unemployed i.e people who haven’t been employed for 27 weeks or longer. it was changed to 1.4 million and accounts for 21.5% of the overall unemployed. However, persons employed on a part-time basis for economical purposes remained at 5 million, which was the same in January 2018. These individuals would prefer to work in full-time jobs but were given only the options to work part time or full time with major cutbacks to hours. 200,000 jobs were created in the month of January for Non-Farm employment. Employment continued to rise in food services and drinking places, healthcare, construction, and manufacturing. Construction had increased their tally of jobs by 36,000 jobs in January. Most of this boost in jobs comes from Specialty trade contractors (+26,000) while employment in the residential building construction rose by 5000. Over the year, the construction sector has set about the creation of 226,000 jobs. Employment in the food services and drinking places sector rose by 31,000 in the month of January. Over the past twelve months, the industry managed to provide 255,000 jobs. The Healthcare industry continued to rise in terms of job creation in the month of January with 21000 jobs. 13,000 of which were jobs created in hospitals. Healthcare added in an average of 24,000 jobs this past month. Employment in the manufacturing sector continues to be on an upswing with +15,000 jobs. The durable goods industry has also been on the rise with an increment of 18000 jobs. Manufacturing overall has brought in 186,000 jobs over the past 12 months. Industries in the US brought in 200,000 jobs which were more than the 180,000 jobs that were predicted. An example of this is the rise in hourly wages by 2.9% yearly in comparison to January of last year. In terms of monthly raises, it has increased by a good 0.3%. This means that the promised growth and recovery from the recession periods are finally starting to show in American wage pockets. Many employers believe that since most of their competitors are providing equivalent wages, employees are leaving their jobs in order to gain more convenience. This has to lead to employers in the US to not only increase hourly wage rates but to improve the quality of the job. Employers intend to curb their attrition by giving employees more valued work and training in multiple skill sets. According to the NY Times, it’s to be believed that unemployed people with a criminal background will not find it extremely difficult to gain employment. This acceptance of unemployed persons with criminal history mostly pertains to fast food restaurant chains, megastores, etc., where the skill requirement is very low. While the unemployment rate remains at 4.1% for the past four months, it isn’t a bad phase. This is because the current unemployment rate is at an all-time low. The last time unemployment rates were low was over a decade ago in 2007. Since then, Unemployment rates have climbed dangerously and then slowly trickled down to the rate it currently is. According to the New York Times, the new tax reform legislation pitched by Congress and signed by U.S President Donald Trump has encouraged employers and companies to increase wages of their employees and also provide them with bonuses. It is believed that not much can be predicted over the long-term consequences of the recent US tax reforms but for the moment, the employees have everything to gain. When it comes to the unemployment rate in America, it is based on the percentage of the total unemployed labor force throughout the country. This helps in reviewing the country’s economy through the years. With this, we understand that unemployment rises during recessions and falls on the rebound. You should know that unemployment declined during the 5 US wars and mainly during World War II. But quickly after the wars ended, there was a spike in recession. During the Great Depression, America faced its highest rate of US unemployment at 24.9 percent in 1933. While in 1931 to 1940, unemployment was more than 14 percent and remained in single digits till 1982 when it rose to 10.8 percent. It was during the Great Recession of 2009 that the annual unemployment rate reached 9.9 percent in 2009. You should know that the lowest unemployment rate was 1.2 percent in 1944. But, you should know that unemployment can get lower based on economic policies and the outcome of companies gaining a foothold in new countries. This means that for a healthy economy, there should be a natural rate of unemployment that should follow. This is usually because people move before they settle down in their new job. Otherwise, they get retained for a better job or stay unemployed and look out for work and wait for the right job. Even when the unemployment rate is 4 percent, it can be tough for companies to expand since they would have a hard time recruiting new good workers. Unlike previous years, unemployment is now at a 44 year low at just 4.1% with several proactive measures brought in to ensure a higher minimum wage and employment opportunities for all. Since unemployment cycles coincide with business cycles, job employment solely depends on whether there are enough good candidates to fill these vacancies. You should know that slow growth hampers employment and in fact causes high unemployment. With the decline in the gross domestic product, businesses will have to lay off workers. This will make jobless workers spend less. Now with lower consumer spending, there is a significant reduction in business revenue in this time period. This forces several companies to make more payroll cuts to reduce their costs and the downward cycle on workers is simply devastating. Remember that unemployment rate is used as a lagging indicator. What this means is that it continues to worsen even as economic growth improves. Companies are hesitant about hiring workers back only when there are sustainable growth and a stable upward trend. That means that when the unemployment rate reaches 6 percent, the government will have to step in. Based on the turn of events the Federal Reserve uses expansionary monetary policy and will lower the federal funds rate. When the unemployment continues, Congress will step in to use its fiscal policy. It can create jobs for public work projects. It can also stimulate demand by providing extended unemployment benefits. The main way to ensure a healthy economic growth rate is by ensuring that there is a steady increase by 2-3% to create 150,000 jobs. Just so you know! There are only two ways to get a country back on track. Countries either choice the usual route of a monetary policy which is a quick fix where money is pumped in to drive growth. Otherwise, the more difficult fiscal policy is used to stimulate the economy with tax spends. Monetary policy is usually the first solution for a quick and effective method. A lower interest rate will make it easier for families to borrow and solve their needs. This includes items like homes, cars, and electronics. It will stimulate enough demand to put the economy back on track. With a lower interest rate, your business can borrow at a lesser rate. This allows them the capital to hire more workers to meet the growing demand. If all measures under this stimulus fail then it will mean that the government needs to make rate cuts and feed the economy with increased taxes to boost businesses. This helps businesses make more money from people that buy into their products once they have the disposable income to make their purchases. A second method is by using the Fiscal policy. This is done by increasing or cutting taxes to stimulate the economy. With an expansionary fiscal policy, there will be a slower time for it to come into effect. Both Congress and the President have to agree on the next steps that follow. This can be more effective when it is executed. This will give the government some teeth to turn things around. The main thing is to gain the confidence of the people by convincing them of a better future. Cutting taxes works in the same manner as reducing interest rates. Both help businesses and consumers to spend more. This increase in demand will provide businesses with more money to invest and hire more workers. Government spending usually takes the form of creating jobs. When the government hires employees, they can do so directly or with contracts through companies to provide services. This provides customers with cash to buy more essential products. In order to best judge the situation across the length and breadth of the US, you should weigh the unemployment rate against GDP growth and inflation. You will find a table below representing unemployment since 1929 when the stock market crashed. 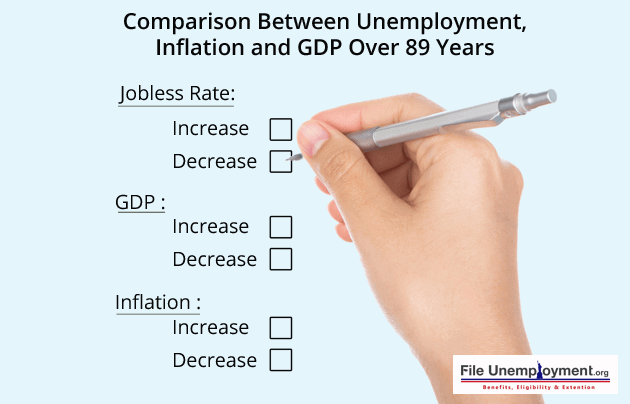 This table compares the unemployment rate, GDP growth, and inflation. When it comes to the inflation rate, it is the percentage change in prices from one year to the next. These changes result in a business cycle. The first phase is the expansion where growth is positive and the country can see a 2% inflation. When the economy expands beyond 3 percent, it will create an asset bubble. The second phase is the peak when the expansion ends and contraction begins. Well in the third phase, you will find a contraction which results in a recession. Inflation usually falls below 2.0 percent and then deflation looms. The fourth phase is called the trough and this is the month when the contraction ends and the expansion begins. You should know that inflation responds to monetary policy that is enacted by the Federal Reserve. The Federal Reserve will focus its attention on the core inflation rate and will exclude things like volatile gas and food prices. The Fed sets a target inflation rate of two percent. If the core rate rises much above that, the Fed will execute a contracting monetary policy which increases interest rates and shuts down demand and thereby lowers prices. For a record 10 straight years, the United States has had 3 percent growth in Gross Domestic Product based on data by the Bureau of Economic Analysis. In 85 years since the BEA’s existence, the annual change in real GDP there was only one ten-year stretch between 2006 to 2015. This is because real annual growth in GDP peaked in 2006 at 2.7 percent. After which it has never been this high again. The last recession ended in June 2009. In 6 calendar years from 2010 to 2015, real annual GDP growth has never exceeded the 2.5 percent it reached in 2010. The longest consecutive stretch of years in which the US saw real growth by 3 percent or better was a seven-year period between 1983 to 1989. The second longest period was a growth of 3 percent between 1939 to 1944 during World War II. In the last two years, annual growth has been stagnant at 2.44 percent. In the fourth quarter from 2016 to 2018, it is projected to grow only by 2.7, 2.5 and 2.4 percent. This primarily means that a steady growth rate of 3 percent is good for the economy. But, unless there is higher growth the economy will tend to stagnate and the number of jobs that are open for new faces will not grow significantly and this will create a problem if the number of new openings does not increase year-on-year, the unemployment rate does not fall further. If it depends solely on government policy through correction to make America continue its growth trajectory which does not rely solely on government jobs and contracts. Long term unemployment is a perennial policy concern for several reasons. First, it tends to have detrimental effects on the individuals involved. Workers’ human capital (whether actual or perceived by employers) may deteriorate during a spell of unemployment, and the time devoted to job search typically declines. Both factors imply that the chances of getting employed may increase thereby reducing the time period used up for job search. More generally, long-term unemployment adversely affects people’s mental and physical well being and it is one of the most significant causes of poverty for their households. Second, insofar as the long-term unemployed become gradually detached from the labor market, they play a reduced role in the competition for jobs. This means that unemployment is less effective in curbing wage pressure, potentially leading to even further increases in unemployment and its persistence (Machin and Manning, 1999). These and related considerations have motivated a wide variety of policies to address the problem of long-term unemployment. Policy interventions combine elements of ‘stick’ and ‘carrot’. They involve job search requirements and sanctions to promote sufficient search effort; or direct assistance to the unemployed, including help with their job search process and training provision. In addition, governments may provide wage subsidies to firms that hire the long-term unemployed. A number of social experiments in the United States provide evidence on the effects of job search assistance and stricter search requirements. The combination of these two policies often leads to a reduction in the time spent on unemployment benefits. At the same time, this does not necessarily mean that everyone coming off benefits is being employed in a new job (Card et al, 2010). The US evidence on the effects of training programmes for welfare recipients and employment subsidies is, at best, mixed. The overarching conclusion is that these programmes – at least in the short term – are often ineffective at improving the re-employment chances of the unemployed and in several cases would not pass a cost-benefit test. 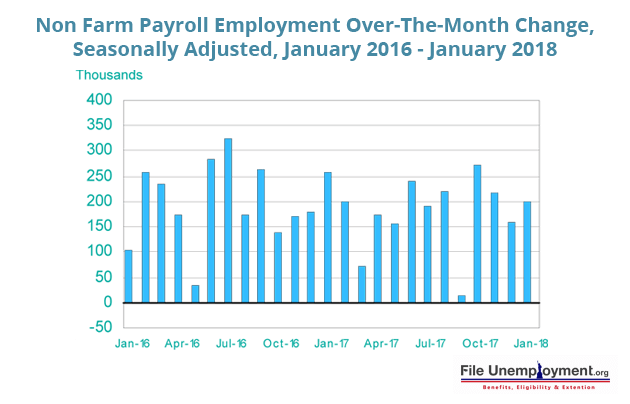 In January 2017, the Bureau of Labor Statistics released the December 2016 jobs report. 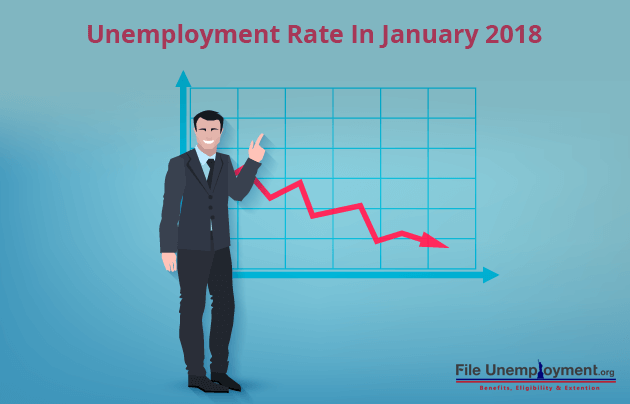 The new numbers demonstrated a positive sign towards a reduction of unemployment, with employers reporting net job growth of 2, 30, 000 for the month. However, one disturbing aspect of the report should be the relatively high rate of long-term unemployment. While the percentage of jobless workers unemployed 27 weeks and longer has been trending downward in recent years, it is still exceptionally high by historical standards and has shown no signs of improvement in the last 6 months. Even more disturbing is the relatively high rate of “extreme” long-term unemployment, the condition of being unemployed one year or longer. The figure below shows extreme long-term unemployment as a percentage of total unemployment from May 1977 to present. Currently, as per the Bureau of Labor Statistics reports, there are over 2.1 million Americans who have been out of work over the past 18 months. It is noteworthy that in both 2015 and 2016, the average duration of unemployment was 16.3 weeks; as of last month, i.e. December 2016 the average unemployment spell was around 40 percent longer at 27.6 weeks. And because most of the long-term unemployed are no longer eligible for unemployment insurance, they have to get by without any public support. In May 2013, a Joint Economic Committee was constituted by the US Congress to come up with solutions to tackle the menace of long term unemployment and also suggest remedies through collective participation of employers and employees. The Committee came up with a list of guidelines which are still in the process of being implemented right from the grass-root level to the national level. Providing incentives for private-sector employers to hire veterans and the young, including extending or expanding tax credits. Streamlining the process of obtaining certifications and occupational licenses. Furthering higher education opportunities for young early-career and mid-career professionals. Building upon existing programs to ensure that both young persons and returning veterans can obtain the training required for jobs in growing industries. Ensuring that returning veterans have the assistance they need in transitioning from active duty to the civilian workplace. 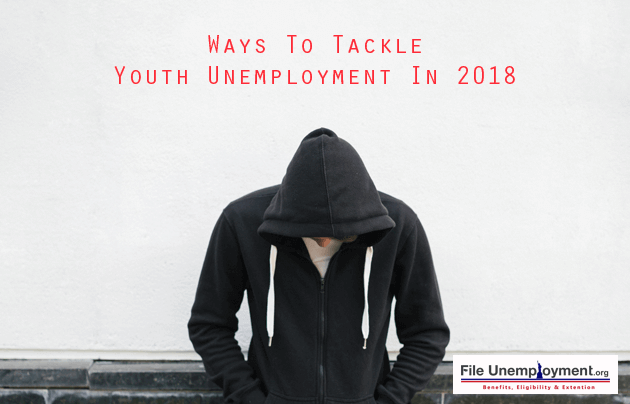 It remains to be seen now whether the above guidelines are implemented effectively over the next 5-6 years to do away with the issue of long term unemployment. Counselling the long term unemployed aged between 25-45 by orienting them to change the professional avenue they may have been involved in, earlier. For example, orientation to switch over from a job that involves physical labor to one that involves more of skilled mental labor. The Department of Labor and the Departments of Training and Skill Development need to organize long term training programmes at economical rates to help the unemployed population develop hard and soft skills for different types of jobs. This will increase options at the time of job search at an individual level. Education at all levels including the undergraduate and postgraduate levels should ensure inclusion of practical training programmes best suited for a particular profession through long term engagements such as research projects, internships etc. Individual psychiatric counseling should be provided through both the public and private health care system to keep the unemployed population motivated for long periods and to guard against the cons of long term job search and its effects on a person’s mental and physical health. Every state should prepare a list of their unemployed population and make special efforts to place the right people in the right jobs by dividing the existing population and creating a talent pool for various kinds of organizations. This will ensure people with the right kind of educational background (in case of freshers) and the right kind of work experience (in case of those with work experience) walking into the right organizations best suited to the needs of both the employers and the potential employees. The Department of Labor should reach out and tie up with recruitment consultant agencies to notify the unemployed about vacancies in government jobs more often. Currently, the agencies only notify about vacancies mostly in the private sector which limits the options for the unemployed. Identity theft and identity fraud are terms used to refer to all types of crime in which someone wrongfully obtains and uses another person’s personal data in some way that involves fraud or deception, typically for economic gain. Unlike fingerprints, which are unique and cannot be given to someone else for their use, personal data­ especially Social Security number, bank account or credit card number, telephone calling card number, and other valuable identifying data ­ can be used, if they fall into the wrong hands. In the United States and Canada, for example, many people have reported that unauthorized persons have taken funds out of their bank or financial accounts, or, in the worst cases, taken over their identities altogether, incurring huge debts and committing crimes while using the victim’s names. In many cases, a victim’s losses may include not only out-of-pocket financial losses but substantial additional financial costs associated with trying to restore his reputation in the community and correcting the erroneous information for which the criminal is responsible. According to the reports of the US Department of Justice released in 2010, an average of 193 federal cases of cyber crimes was prosecuted by the Department of Justice. The US Sentencing Commission is in the process of bringing out its annual report of 2016 which will reflect the number of victims of Cyber Crimes between 2015 and 2016. Americans have been victims and suffered harm as a result of the theft of their identity in the last twelve months. Furthermore, the agency also released a commission report detailing its identity theft program since its inception. The survey found that within a period of one year, 2.28 million consumers discovered that new accounts had been opened and other fraudulent activities such as renting an apartment or home, obtaining medical care or employment, had been committed in their name. In those cases, the victims were categorized as follows: 2.28% Existing Credit Card Account Fraud, 1.15% Existing Non-Credit Cards Accounts Fraud, and 0.83% new accounts and other Fraud, with a mean fraud loss of $ 5,803 per victim. Existing Credit Card Accounts fraud is the least costly classification, while New Accounts and other Frauds with a mean loss of $ 12,646 is the most serious category. Existing Non-Credit Card Accounts fraud, which includes existing credit and saving accounts, is the mid-range classification with a mean loss of $ 9.912. Social Security Numbers (SSN): This number was created to keep an accurate record of earnings and pay retirement benefits on those earnings. Date of Birth (DOB): Date of birth, in conjunction with other pieces of information, can be used in many ways to compromise a person’s identity. Current and Previous Addresses and Phone Numbers: Both can be used in cybercrime and identity theft to enable an offender to assume the identity of the victim or to obtain more information thereabout. Current and Previous Employment Information: Such information can be used to jeopardize the victim’s identity. Financial Account Information: This includes checking and savings accounts, credit cards, debit cards, and financial planning information. Such information is a rich source for an identity thief to commit financial cybercrimes. Mother’s Maiden Name: In many instances, the maiden name of the victim’s mother may be used as the password for financial accounts and is easily available through public record information. Other Personal Information: This includes passwords, passcodes, email addresses as well as photos. Such information could be utilized to obtain access to other sensitive information or to facilitate total or partial identity theft. Anyone who is concerned with the possibility of identity theft should adopt techniques designed to stop these kinds of crimes before they happen. A great deal of information about identity theft prevention is available from trustworthy sources, such as state attorneys general offices, the United States Department of Justice, and local consumer protection agencies. Among the most effective strategies to avoid becoming a victim include conducting regularly scheduled credit report reviews, using online passwords that are unique and difficult to guess, shredding financial documents before throwing them away, and sending and receiving mail using a secure mailbox. 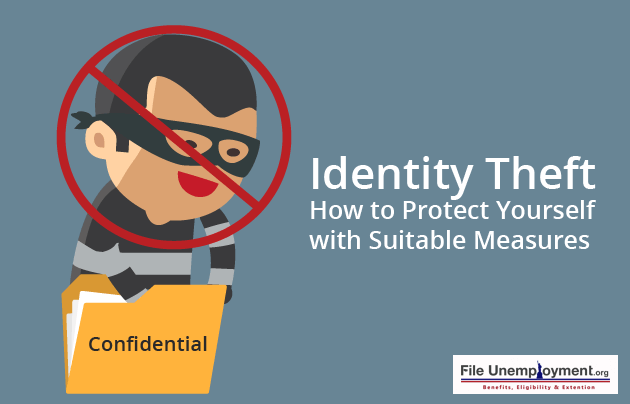 Taking the recommended precautions is no guarantee against identity theft, however. One of the best ways for people to minimize the loss in the event they are victimized is to learn to recognize the signs that a crime has occurred. Unfamiliar entries on credit reports are a strong indication of identity theft. Other signs include bills arriving in the mail addressed to someone else, a sudden increase in pre-approved credit offers, and unexpected telephone calls from debt collectors. It is important to quickly follow up on such occurrences to determine their cause. Those who suspect an identity crime is being committed should immediately report the incident to the appropriate credit agencies and law enforcement officials. It made identity theft a separate crime against the individual whose identity was stolen and credit destroyed. Previously, victims had been defined solely by financial loss and often the emphasis was on banks and other financial institutions, rather than on individuals. It established the Federal Trade Commission (FTC) as the Federal Government’s one central point of contact for reporting instances of identity theft by creating the Identity Theft Data Clearing House. It increased criminal penalties for identity theft and fraud. Specifically, the crime now carries a maximum penalty of 15 years imprisonment and substantial fines. It closed legal loopholes, which previously had made it a crime to produce or possess false identity documents but not to steal another person’s personal information. 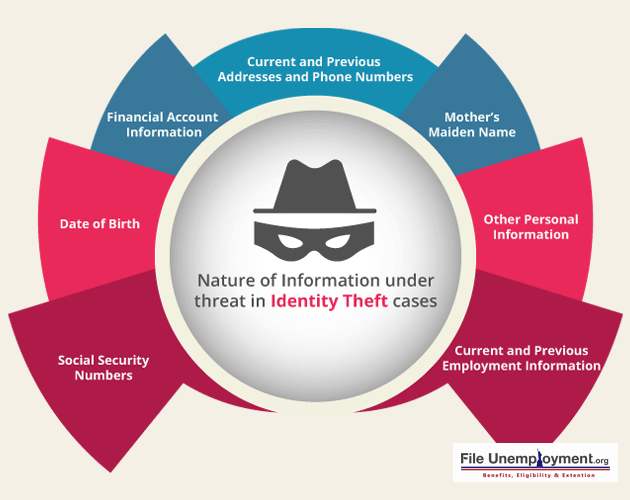 Identity theft, therefore, remains a big threat for individuals and businesses in the 21st century which can be prevented effectively by taking the precautionary measures mentioned above. However, the perspective of law enforcement to prevent identity theft still remains a grey area as the US Department of Justice has struggled in the last 15 years to adopt counter-measures to tackle this issue. All measures adopted so far have been reactive rather than proactive. Thus, it remains to be seen what measures are adopted in the next 20 years to deal with this menace both from the technological and legal perspectives. Sometimes your supervisor would find it difficult to be in sync with their surroundings and find it hard to stay relevant. This makes them usually come across as negative, self-centered, driven by numbers and treat their employees as resources and not as human beings. As subordinates, we usually excuse them for their lack of knowledge or rude behavior because they are your immediate manager or because they are known as the rainmaker in the company. Also, policies may be created in their favor and this makes it difficult to fire them. There may be several ways to approach this. As an employee, you could choose to create a Renewal Process where you could look to find scope in assisting your manager to determine where the company is headed. Questions like “What could this organization be like in 10-15 years if everything were ideal?” or “What is our purpose?” could go a long way in establishing a vision of what you would like to work towards. This could also assist your manager and you to establish a cause that is worthwhile and it helps re-establish a mission for your team. Another approach would help your boss get some training and help by enrolling for courses or meeting a coach or advisor. This will ensure that your manager gets the best possible training, learns how to work with difficult situations and develop key skills to help optimise work. Also, a senior HR would be able to help to give them some direction and provide them with a sense of purpose. There are times that people cannot change their manager’s foresight and approach to work and hence there are several people that take to renewal activities. This could be meditation, yoga, assisting others, playing a sport, exercising at the gym or outdoors and some even spend time in prayer. This helps them keep a positive outlook on their work and maintains a balance between their personal and work life. This could at times be overwhelming and exhausting if you do not find an outlet to just let go. This could lead to consequences at work and with your family and work would slowly digress to being mundane and not fun nor exciting. So before you have to decide on the final option of leaving, you should think of every possible way to keep the creativity flowing, find more things which are of interest and something which will help you grow. Brainstorm on Strategies: Your coworkers and you might have come across some improvements and changes to enhance your workspace. 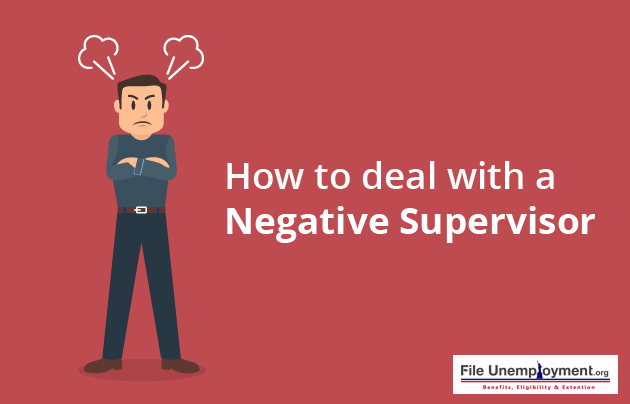 Whatever the scenario, a negative boss cannot stop forward thinking. Look at how you can find changes and ways to improve your workplace and look at how you can make it acceptable to your manager. If they agree, then you should look at re-creating successful strategies and look to propose for something new. Stop excessive interaction: Ensure that you keep face time to a minimum and keep all encounters polite and civil. Spend a lot of time with people that are positive and have a can-do attitude so that your attitude does not turn negative. Innovation is the key: Look to innovate especially when you find time outside of work. This will ensure that you engage in a creative manner. You can look at forward-thinking activities like volunteer work, part-time work, an internship or hobby to stay fresh and relevant to strengthen your innovation muscles. Put suggestions on paper: Make sure that all your suggestions are on paper and not sent by email or explained in person. The longer the response takes, the more likely it is that a knee-jerk resistance is likely to change. This will allow your manager to weigh the idea based on its merit. Revisit your idea: Look at how your boss can revise your idea and propose it as their own. This can be quite annoying when they turn down your idea and uses it as their own. But if you come to think of it, you have made progress and it is a win for you even if it involves accommodating an overinflated ego. Develop a coalition for innovation: At times, you should work with others who are in power in your workplace to build a strong personal network that will enhance your ideas and bring about a positive change. Working with a coalition is sure to bring about some sort of innovation. They might have access to help your boss decide and force them to bring your unit in line to look at a new direction that you created. Look out for the bottom line: You should look to jump ship if the boss is determined to run you up on the rocks. This could be the biggest problem especially when they resist change. Look for another job with a better manager and more momentum to see your idea through. Once you know how to adapt to your work and your surroundings, you will be able to create a suitable workaround to ensure that you stay true to your calling. You can pose your opinion or strike a conversation with the Community and stay informed about jobs, news and how to build a positive relationship with your manager. 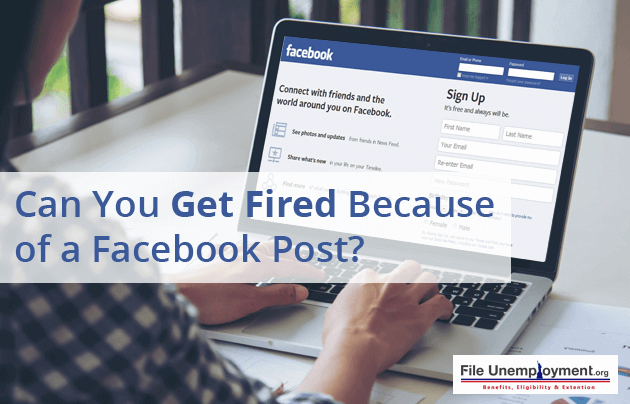 Wondering if you can get fired for posting something on Facebook and other social media? The majority of people believe that the First Amendment to the United States Constitution, which prohibits the government from abridging freedom of speech, protects their right to say anything they want, online or off. This is true when it comes to the government. Within limits, the government may not tell us what we can say or what we can’t. But there is no such restriction that applies to Private Employers. In short, yes, you can be fired for what you post on social media like Facebook or any other site. However, there are certain laws that limit the extent of an employer’s right to fire or discipline employees for what they post online. Luckily private employers can’t discipline or fire employees for anything that they dislike on their employee’s social media. There are laws that limit an employer’s right to discipline or fire employees for the content that they post online. The restrictions, however, are dependent on what it is that is written about. Protected Concerted Activities: The National Labor Relations Act that governs the relationship between the company’s management and unions, protects the rights of employees to communicate with each other about the terms and conditions of their employment. This right is subject to whether the workplace is unionized or not. The National Labor Relations Board (NLRB), the federal agency that imposes the Act, in recent times, has displayed a special interest in enforcing this right against employers who discipline their employees for the content they post online. A group of employees who make comments about the working conditions or criticize the management on social media may be found to be protected concerted activity. The employees may not be disciplined or fired for this. Political Messages: A select few states protect their employees from discipline on the basis of their political beliefs and activities. In such states, if an employee is disciplined or fired for expressing political views online, he/she may have a legal claim against the employer. Off-duty Posts: Few states forbid employers from disciplining employees for what they do in their personal time. This is as long as those activities are legal. In states like these, an employee may be protected from discipline for online posts. Retaliation: There are a number of federal and state laws that protect employees from retaliation due to reporting certain types of problems (harassment, discrimination, unsafe working conditions, etc,). If an employer takes action against an employee who reports a problem online, that could constitute illegal retaliation. 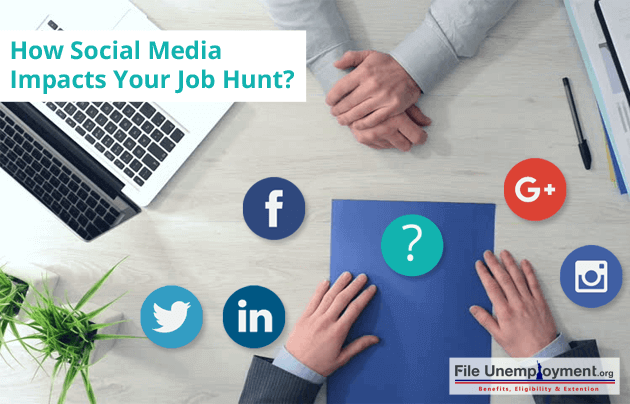 An employer cannot fire an employee for venting on social media. Employees are allowed to vent. If they post about finding it difficult to work or how they find the work environment unpleasant, they can’t be fired for that. The government protects workers’ rights to talk about where they work even if it is insulting and harsh. Whether it is work hours, pay, assignments, dress code, or tough supervisors, it’s illegal for an employee to be fired on these grounds. The NLRB upholds firing that is based on posts that damage a company, trivialize their products and services, reveal trade secrets or financial information. Posts that encourage subordination as well are not protected. Employees can be fired for posting information about customers or clients. Employees are not protected against homophobic, racist, sexist posts or posts that discriminate against religion. The NLRB does not protect employees against posts that are not related to working conditions. For example, posts ridiculing the way the boss or a co-worker looks, speaks or dresses are not protected. Kimberly Swann was fired for posting about her job on the first day of work. Three weeks later, the message made its way to the upper management, and she was fired. Gloria Gadsden, a professor of East Stroudsburg University got fired for posting a status a few days after the Feb 12 shooting at the University of Alabama. A prospective employee at a company who was supposed to pass a drug test and a physical test posted this, after which the offer was withdrawn. 4. A guy once made a post talking about wanting to go home and play The Sims so he could create the telecommunication store that he worked at in the game and then slowly kill off all the customers. The post was made while he was working on a late night shift. He later got fired for it. Now that you know what is safe and what is not safe to comment, like or post on Facebook and other social media, you can fight for your rights if falsely accused. 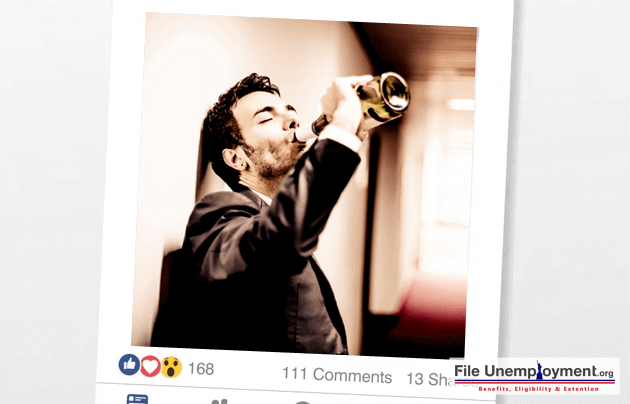 Employers often scan their prospective candidates’ Facebook profiles to get a glimpse of their personality before hiring. If you have any sexist or racist comments on Facebook, it’s best to delete them before you head for an interview.